Luckily for Cincinnati fans, The Carnegie has assembled a crew of talented professionals who have put together a very cohesive, beautifully sung, and even better acted production. First, kudos to Steve Goers and Jamey Strawn who’s piano work supported this minimalistic show very well. It allowed the voices to shine and Jamey Strawn’s work as musical director is marvelous. Some of those harmonies . . . just wow! Director Ken Jones has staged the show in a fairly straightforward way – there’s not a lot of room to play with on the super high and cozy Carnegie stage – but he takes full advantage of his talented Ensemble and Bruce Auerbach’s set design to tell a cohesive and easy to follow story. I also enjoyed the lighting effects very much, thanks to Wes Calkin. And if the Carnegie is not the hardest venue in town to deal with acoustically, I’m not sure where is . . . but Kevin Seamancik seems to have quite a handle on it. It’s the little things . . . even when a mic cue was late, he has the good sense to fade in rather than clicking on. Those little professional touches matter very much. Performance wise I was especially taken with the work of Mathys Herbert, who plays Tobias Ragg. I’ve known for many years that Mathys is one of the most talented character actors at Wright State University and now Cincinnati audiences are going to find out just what this young man is capable of. You think he’s great in this show? Wait til you see him do comedy. Also, Ben Biggers, a Junior at UC-CCM, does a nice job as Anthony; Kaitlyn Sage’s soprano matches nicely with his voice and their chemistry is good. Michael Sherman, who really kicks the show off vocally, is such a talented performer and I don’t know why I’m just now learning about him. His work in “Serials!” at Know Theatre has been hilarious, but the darkness he brings to Judge Turpin is something to behold. Beatle, played by Sean P. Mette, is someone who I’ve under appreciated until now. Jones has really brought out the best in Mette; good for them both. And how fun is it to see Ed Cohen on stage, holding court over the crazies in the Asylum? Helen Anneliesa Raymond-Goers (along with Sherman) are the theatre directors at Walnut Hills High School. If they can teach their kids how to act the way they do, then I want to see a Walnut Hills production. 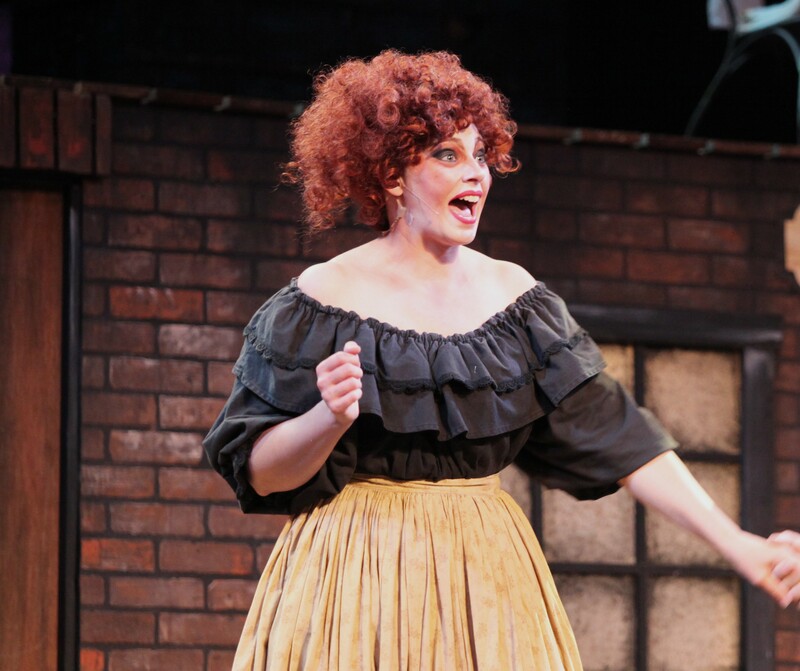 As Mrs. Lovett, she finds the raucous-ness, the wild abandon the role requires, and the performing chops to take her just close enough to caricature without crossing the line. Her chemistry with both Herbert and Sweeney himself was pitch perfect. And let’s talk about Sweeney, shall we? Justin Glaser has a marvelous singing voice. But on top of that, his stage presence and his ability to convey emotion blew me away. He is a star and while there wasn’t a weak performance on stage, he seems born to play this role. His tall, lanky frame, his dark, brooding facial features, and that rich, deep voice . . . well, he is already a candidate for everyone’s end of the year awards, I’m sure. Joshua Steele, producer, has assembled quite a team here. Shows at the Carnegie just keep getting better and better and I’m excited to see the rest of their spectacular season. You can hear our conversation about it here. 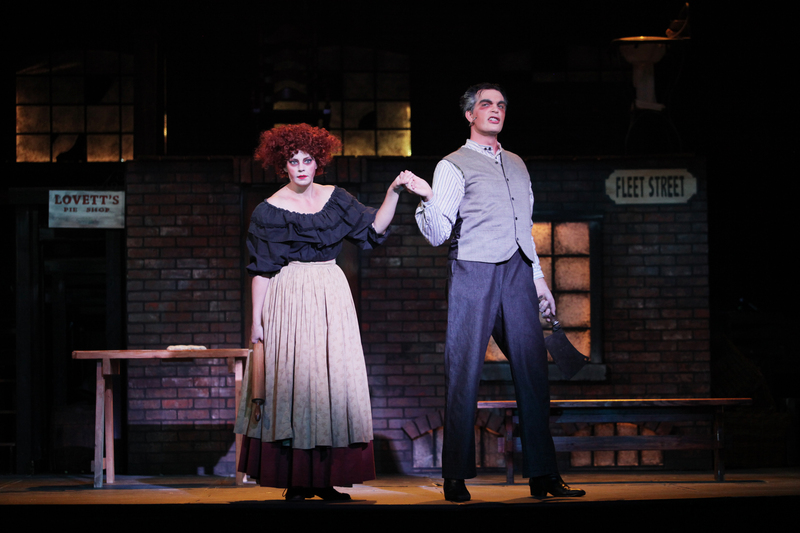 You do not want to miss SWEENEY TODD; its a must see.